April 1, 2011 - The World Trade Organization (WTO) final case ruling published on Thursday confirms the massive market advantage Airbus has enjoyed from billions in illegal government subsidies provided to fund the company's commercial airplane product line since its inception more than 40 years ago. "This WTO ruling shatters the convenient myth that European governments must illegally subsidize Airbus to counter U.S. government assistance to Boeing," said J. Michael Luttig, Boeing executive vice president and general counsel. 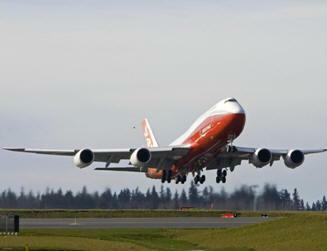 "The ruling rejects 80 percent of the EU's claims against the U.S., finding no more than $2.7 billion of impermissible subsidies to Boeing not previously remedied. That amount includes $2.6 billion in NASA R&D funding, which is but a small fraction of the total amount challenged," Luttig said. This ruling resulted from the European Union's attempt to counter a U.S. case that successfully challenged illegal subsidies to Airbus. Last June, the WTO upheld approximately 80% of the U.S. claim, finding Airbus had received more than $20 billion in illegal government subsidies, which harmed the U.S. aerospace industry and resulted in the loss of billions in exports and tens of thousands of U.S. jobs. Illegal government subsidies to Airbus included $1.5 billion in R&D subsidies, $1.7 billion in infrastructure subsidies, $2.2 billion in equity infusions, and $15 billion in launch aid (including $4 billion for the A380) ? a subsidy that is unique to Airbus and is the most pernicious and market-distorting subsidy under the law. "Comparing today's decision with the decision last June reveals a market distorted by Airbus' practices, with illegal launch aid being the key discriminator," Luttig said. "The WTO ruling on launch aid goes to the heart of the Airbus business model, which now must change. In contrast, there are no comparable findings or consequences to the U.S. or Boeing from today's decision, as the WTO has now fully and finally rejected most of the EU's claims." Both sides may appeal Wednesdays ruling. Once any appeal concludes, Boeing will support whatever steps the U.S. government deems necessary to fulfill its WTO obligations, and expects the same commitment to compliance from Airbus and its sponsor governments. "Illegal launch aid must end. Airbus must take immediate steps to withdraw the outstanding prohibited subsidies provided to the A380, and it must finance the A350 and all other future programs on commercial terms. With $16.6 billion of cash on hand, EADS/Airbus can, and now must, develop its products without illegal government subsidies," said Luttig. Luttig said the WTO had done an outstanding job adjudicating the subsidy dispute. "An impartial arbiter has spoken, and has set important precedents for all nations with ambitions to grow their aerospace industries. Compliance with WTO rules is essential to fair play and to the public's confidence in the global trading system," he said.